Someone requested sources for yesterday’s chart of changing Venezuela oil output goals, so here you go. As you’ll see, it was a bit of a rush job, with a motley bunch of sources. 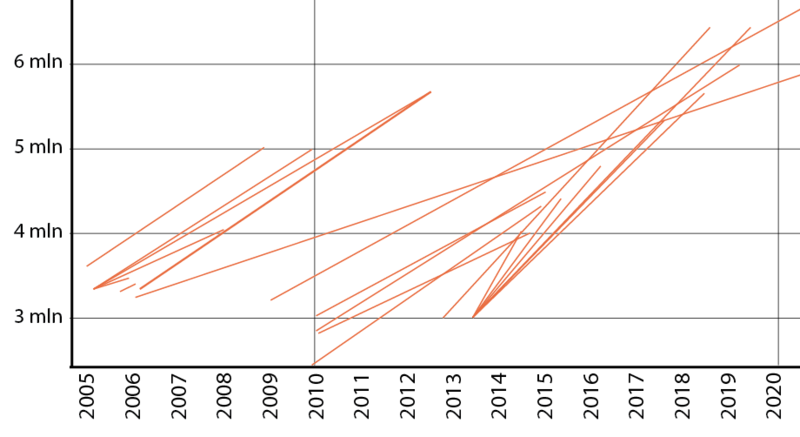 Someone might do better with different sources and better graphing software (I was just sketching in Illustrator). But I think it’s fair all the same. The change over time has been clear — ever more ambitious goals with nothing to show for them. One thing not included in every article, book or report is the baseline figure. I tried to find Ramírez quotes from the same time period giving the baseline. This entry was posted in Uncategorized on October 25, 2013 by Steven Bodzin. It was nice while it lasted, but Venezuela’s minister of people’s power for oil and mining, Rafael Ramírez, has left us. He used to be considered a pragmatist and would offer plans that, while, ambitious, were often within the range of the human imagination. No more. Check out what’s happened to the oil output plans for state oil company Petroleos de Venezuela SA over the past eight years. The vertical axis is barrels per day. The lower left corner of each line is where the company says its starting out. The upper right end of the line is where it plans to end up, months or years later. This entry was posted in Uncategorized and tagged oil, pdvsa, stats, venezuela on October 24, 2013 by Steven Bodzin. Original, with full context, here. Short version: TV host Vladimir Villegas is pressing Venezuelan pro-government deputy Freddy Bernal for specific examples of companies or people who may have stolen from the country. Freddy Bernal: En esta concierto para delinquir, hay empresas por ejemplo una empresa denominada Derwick. No sé quien será el dueño. Derwick. Esa empresa contratada con el estado. Bernal: Sí, empresa venezolana. Y esa empresa compro, nada más y nada menos, que en Nueva York, el apartamento de Aristóteles Onassis. Bueno, yo creo que, creo que vale la pena investigar un caso de esas características. Freddy Bernal: In this symphony of crime, there are companies like, for example, a company called Derwick. I don’t know who would be the owner. Derwick. A company with state contracts. Vladimir Villegas: A Venezuelan company. Bernal: Yeah, a Venezuelan company. And this company bought, in New York, nothing less than the apartment of Aristotle Onassis. Well I think, I think it’s worth the trouble to investigate a case with these characteristics. Next time that Derwick Associates deigns to accuse me and other reporters of being “agents” in a “defamation campaign,” I hope they also include Mr. Bernal. Just for consistency. This entry was posted in Uncategorized and tagged corruption, derwick associates, usa, venezuela on October 23, 2013 by Steven Bodzin. This entry was posted in Uncategorized and tagged derwick, lawsuits, us, venezuela on October 22, 2013 by Steven Bodzin. Vice and the Daily Dot have reported on a big network of “sock puppets,” or undisclosed related parties on the Internet, who have been manipulating Wikipedia to boost the profile and reputation of companies on behalf of a PR firm. Ars Technica reports today that Wikipedia has now disabled 250 user accounts as part of its investigation. However, as Daily Dot mentions, there are still many paid editors and sock puppets on Wikipedia. One company that has aggressively used paid editors and socks to first seek to eliminate its page entirely, and later to edit the page to be as positive as possible, is Derwick Associates. This entry was posted in Uncategorized and tagged derwick, reputation management, usa, venezuela on October 21, 2013 by Steven Bodzin. This, based on the State of the Oceans Report. “The health of the ocean is spiralling downwards far more rapidly than we had thought. We are seeing greater change, happening faster, and the effects are more imminent than previously anticipated. The situation should be of the gravest concern to everyone since everyone will be affected by changes in the ability of the ocean to support life on Earth,” says Professor Alex Rogers of Somerville College, Oxford, and Scientific Director of the IPSO. The “what you can do” part of that article, however, is weak. Step one: Drive less, fly less, eat less meat. Here’s the state of the oceans. Cheery stuff. This entry was posted in Uncategorized on October 6, 2013 by Steven Bodzin. 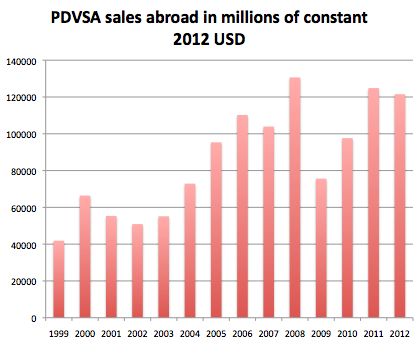 From PDVSA annual reports. I just thought you might be interested. I used the CPI from the US Federal Reserve as a deflator. This entry was posted in Uncategorized and tagged oil, stats, trade, venezuela on October 4, 2013 by Steven Bodzin.